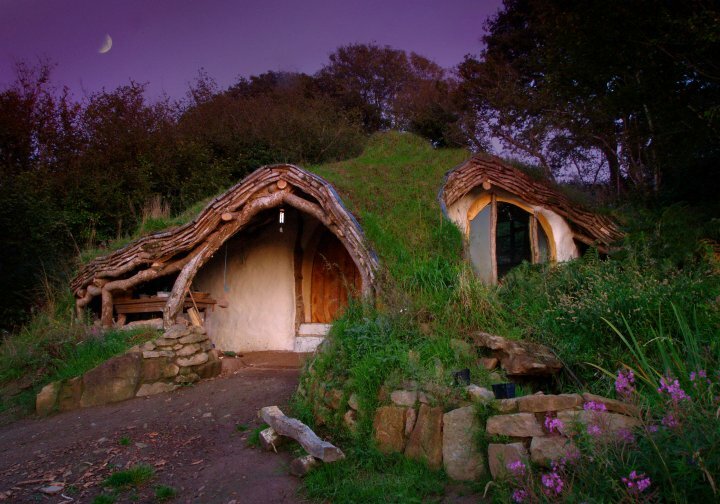 When it comes to eco building, there appears to be a lot of enthusiasm for straw bale homes and for cob homes. Let's just note that if you were to pay someone to have a conventional house built for you, it'd be around $100,000. 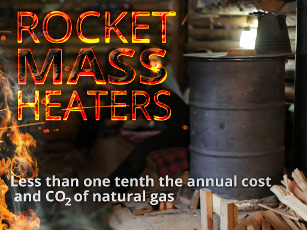 Say you want an eco home built for you, straw bale would be $130,000 and cob would be $200,000. In either case, this is usually nothing more than replacing the exterior walls. Cob could also be used for interior walls, but for the moment, I would just like to examine the simpler case of replacing the exterior walls. With straw bale, the cost of the materials for the exterior walls is higher than a conventional home. The cost of labor is significantly higher, although some of the work can often be replaced by workshop labor. Unless you live on land that produces straw and you have a baler, you will have to buy straw and have it moved to you. 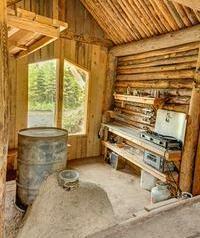 The beauty of straw bale is the insulation. Straw itself is not a particularly good insulator, but a really thick wall of it is. Of course, to stay warm on a really cold day, it helps if you're sealed up inside like being in a ziplock bag. With cob, you will need a source for clay and good sand. Sometimes you are on land that has clay, so then you just need a few dumptruck loads of sand. 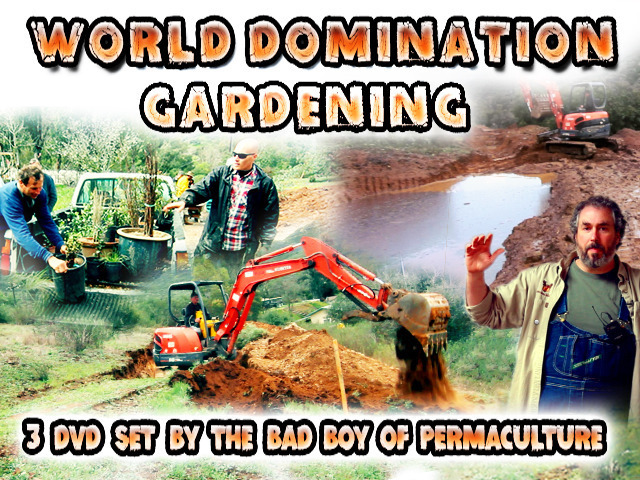 And the amount of time to build a cob wall is far greater than conventional. The beauty of cob is that you can shape it to anything! And it is soooooo easy to do. 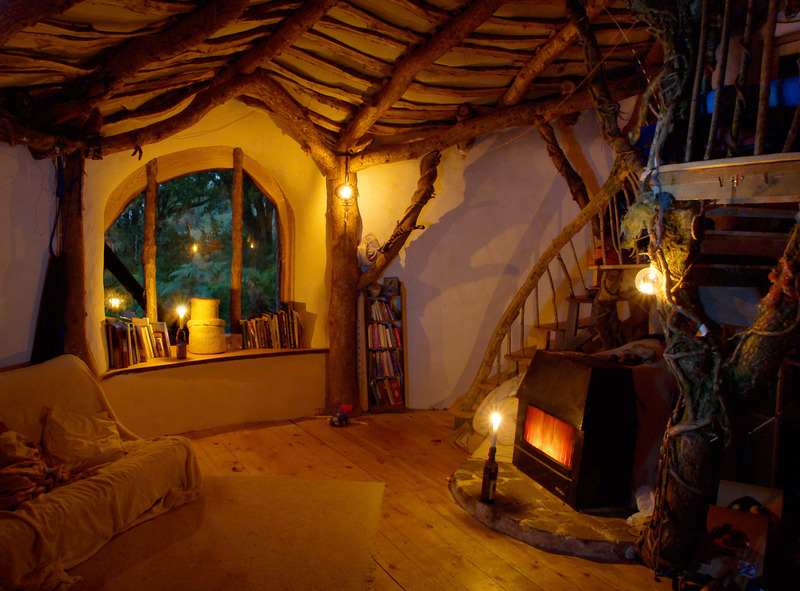 If you can supply lots of time, you can build a fantasticly lovely home from cob. 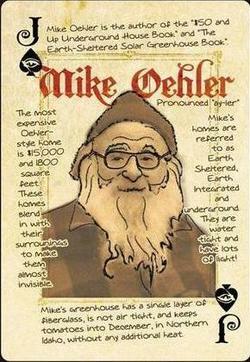 In the fall of 1970, Mike Oehler (pronounced "Ay-ler") lived in a crappy shack and struggled to stay warm. He decided that the following spring he would build a better place to live. 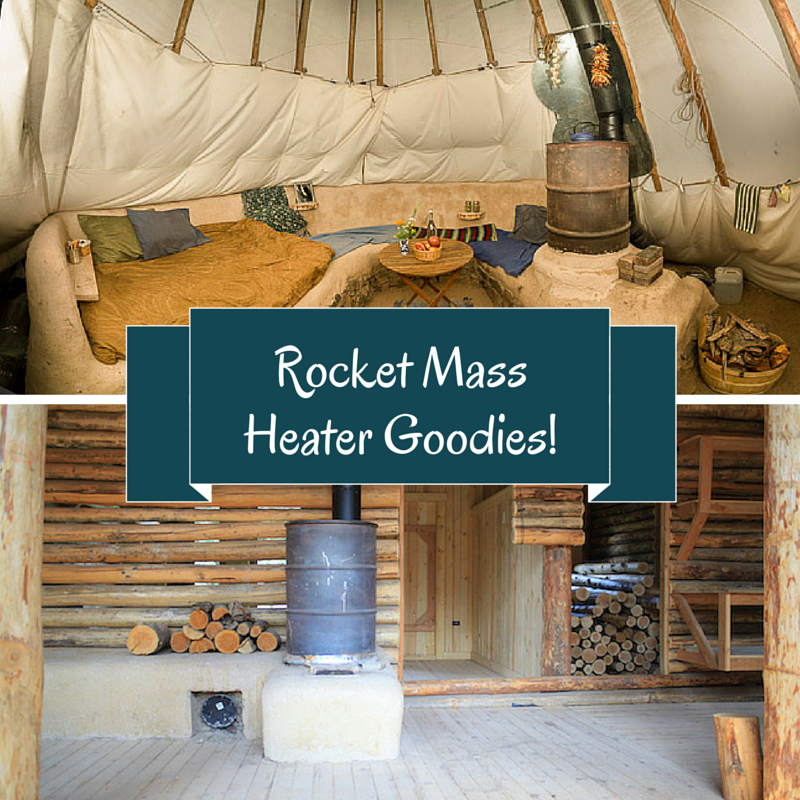 He spent the winter drawing all sorts of designs to calculate heat efficiency. He also wanted to keep his materials costs low. He came up with a design that was unlike anything he had ever seen anywhere else. The result is a home built in 1971 with a total cost of $50. Later, Mike added on to that house and then wrote a book about it. His choice of title was so bad, that I avoided the book for more than a decade. Even the pictures on the cover bothered me. It was only after seeing so many other authors refer to the book that got me to look at a library copy. 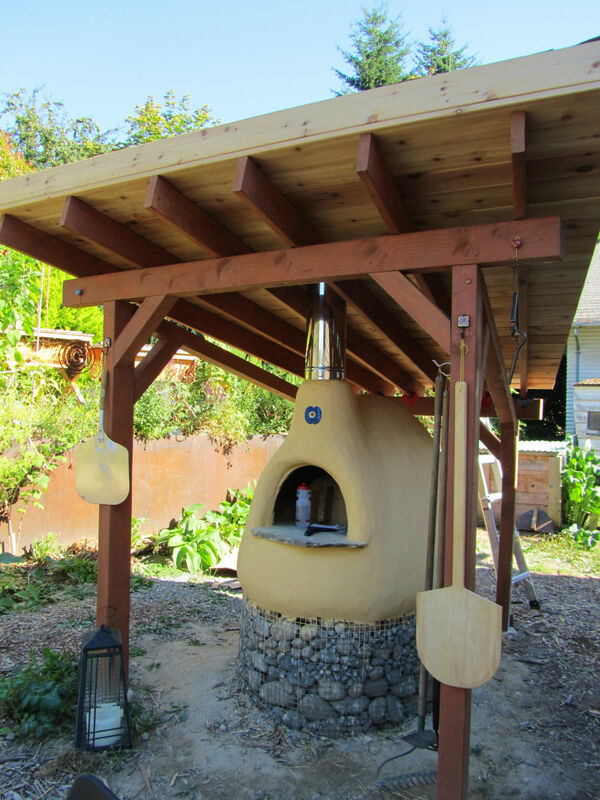 Mike's design eliminates many of the complexities of conventional construction. Further, if you live on wooded land, most of the materials consist of what you cut from your land when doing sustainable forestry thinning. No importing straw bales or dump truck loads of sand. In fact, everything you import could fit into one pickup load: some doors, some glass, some plumbing and electrical stuff - all of which you would bring in for any type of house. 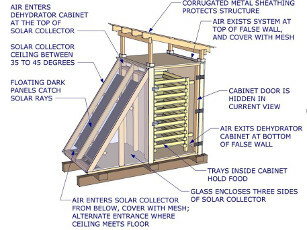 Mike then enhances his original designs to come up with a variety of ways to get sun into his structure from all directions, while keeping the costs low. 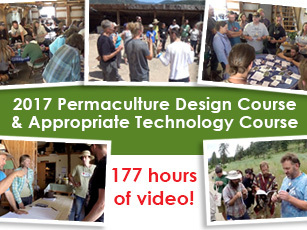 After teaching dozens of workshops on his techniques, he puts the workshop on video. I have seen these videos. They are excellent. 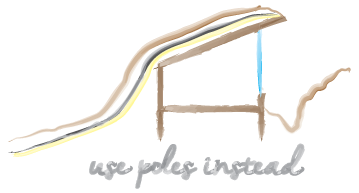 In a nutshell, Mike's design is a pole structure with a green roof. A green roof is usally more expensive than a conventional roof, but, if you can follow one simple design principle, you can dramatically cut the costs of the whole structure! 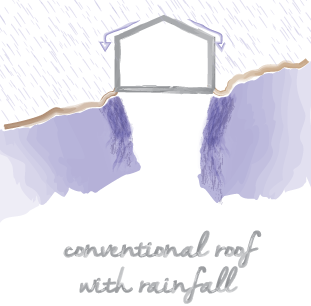 Every drop of rain has a complete downhill soil path and never encounters a roof edge. I contact Mike and visit with him a bit. Now, his excellent design is easily confused with .... lessor designs. Designs which he thoroughly bashes in his book, but you will never find out about that if you cannot get past the title of the book (which is what happened to me). During our conversation, he told me that he wishes to now call his structures "Earth Integrated Structures". For the rest of this document, I am going to disrespect his wish and instead refer to these as "Oehler Structures". 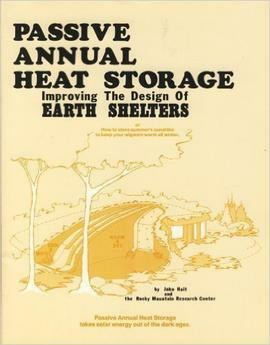 Next, I found a copy of John Hait's book "Passive Annual Heat Storage". In that book, John appears to extend Mike's ideas to include a cheap means to eliminate the need to heat. Basically, surround the structure with 20 feet of dry dirt to produce an enormous thermal mass. It's mostly laying down some extra plastic sheeting and insulation during construction. We are gonna be talking about rainfall flow a lot. 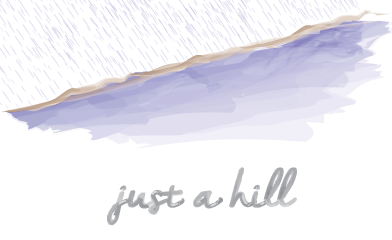 So, for something to go off of, here's an image of a plain ol' hill. We're gonna try and show the water flow underground, so it will be darker where there is more water in the soil. Did you know that most perfumes are made with the stink from skunks? Isn't it weird that something that smells nice is built with something so damn stinky? Due to the confusion that kept me from reading Mike Oehler's book sooner, I am now going to carefully tread into some dangerous territory. I need to express this mostly so I can define what a wofati is NOT. Mike Oehler calls this "a first thought house". I call it "a don't-do-this house". People tend to think of the second pic more than the first. But where does all of the extra dirt come from? Now you can see where all of the people with this terrible design start doing their psuedo engineering. The first thought is to put french drain in the back. But french drain is designed to deal with a water table getting too high - not with too much water coming from above. So while that might help a little, it really doesn't work. The wraparound ditch around the back might help a little, but most of the water is already below the soil level. The bottom line is that people that use this design end up with something that smells like a musty basement and is so riddled with water problems that thousands of these homes are abandoned. I could go on about this, but Mike Oehler's book does a much better job of bashing this design. Starting off with the "don't-do-this house" design, I want to fix the primary problem. I simply pointed it uphill instead of downhill. Don't worry, later I'm gonna poke a massive hole on the downhill side so I can still get all of that amazing view. The important thing to note is that I have now fixed all of the water problems (sound effects for a cheering crowd goes here). And when I say that I did it, I really mean, Mike Oehler (sound effects for a cheering crowd goes here also). The wraparound ditch gives us all the perks that we get in a conventional home. And everything that lands on the roof, goes downhill to where it isn't bothering me. 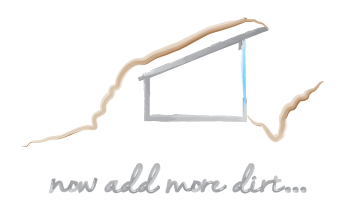 Next, for a few different reasons, I want the amount of dirt on my green roof to be much thicker. To get the dirt, I'm gonna sink the house a little lower in the ground. I also extended the uphill roofline a little. The shell has a waterproof membrane around it. 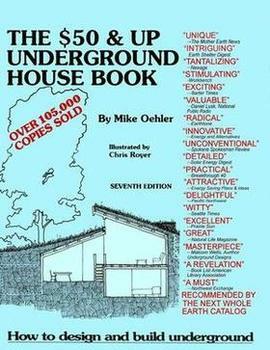 Oehler's book uses polyethylene (a clear or black plastic sheeting). Oehler now uses EPDM (pond liner). I have been using used billboard material with great success. The dirt that is just on the other side of the membrane is often wet. So if there is a heavy rain, or melting snow, that wet is brought right to the house and held up to the house. Remember how a straw bale doesn't have much insulative power, and yet a straw bale wall is considered to be far more insulative than a conventional wall. That's because it is so thick. 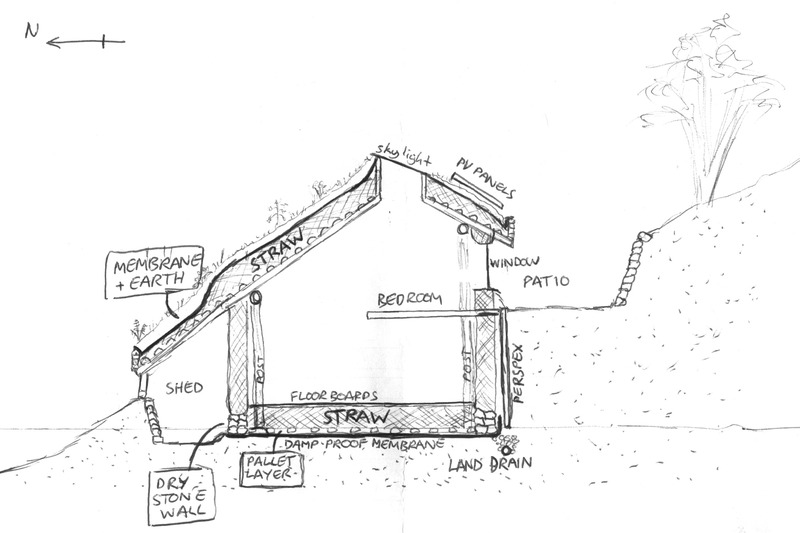 The R value per inch of a typical straw bale wall is rated between 0.94 and 2.68. The R value per inch of fiberglass batts is 3.1 to 4.3. The R value per inch for dirt is 0.05 when wet and 0.33 when dry. Six times more insulative when dry! On top of that, dry dirt has the ability to retain heat for a really long time. John Hait's book goes into a lot of mathematical detail on this and he concludes that if you have 20 feet of dry dirt, you can carry the heat of summer all through the cold of winter. Thermal inertia! Well, I don't want to have a house that is 20 feet deep, and Hait doesn't suggest that. 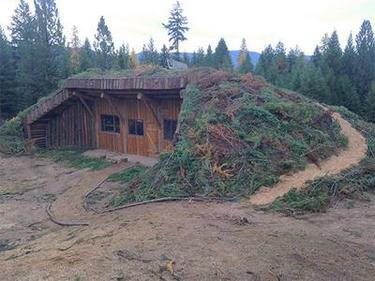 Instead, wrap this much dry dirt around more than half of the house. He has done this more than once and the result is a home that requires no heat. So you have a layer of structure (R 2.5 to R 5), membrane on the structure, about 8 inches of dry dirt (R 2.64), about four inches of wood duff (R 5.0), another layer of membrane and then 20 inches of wet dirt (R 1). This brings our roof R-value to about R 11 or better - pretty good! Plus, a healthy dose of thermal inertia! 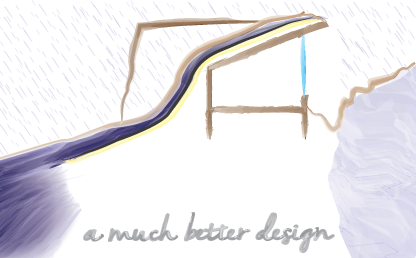 Next - "don't-do-this house" designs are almost always made of cement. I don't know about you, but I've noticed most land doesn't have lots of cement lying around. But many homesteads do have a forest that needs thinning. And it seems that most of the time when the forest needs thinning, the price that the mill will pay for wood is less than what you might pay to get the wood to the mill. A lot of folks that need to thin their trees end up burning this wood! Such a waste! So rather than make this out of cement, I'm gonna make it out of wood. Note that this is now a pole structure. Much stronger, in my opinion. But this still isn't a wofati house. It needs one more thing. What you see so far is a home that looks like a log cabin from the inside; requires little, if any, heat; can be built very fast and cheap. But it has light coming in from only one direction. Uphill. 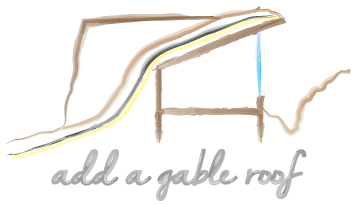 This is my feeble attempt at drawing in a gable roof to the downhill side. Here is a drawing from Mike Oehler's book, page 46 (with permission from mike). This shows an example of light from four directions. It also shows an example of a downhill gable roof - one of the key ingredients in a wofati house. 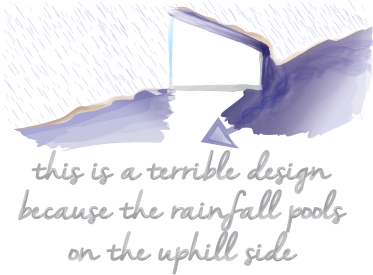 Note that the combination of wrap around ditches plus the overhang minimizes the amount of water on the uphill side. 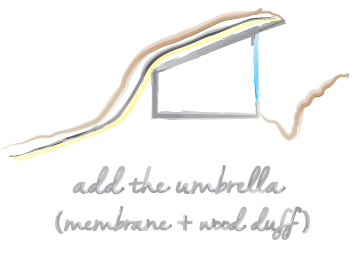 The extended membrane makes for a huge thermal mass downhill and directly below. where does the word "wofati" come from? 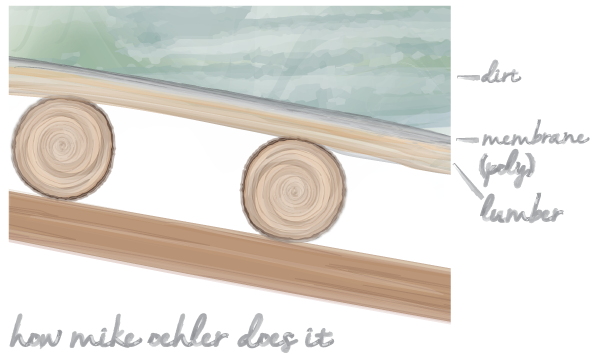 Mike Oehler used a word from a crappy design to help define his design. I suspect that that poor choice eliminated 90% or more of the folks that would otherwise embrace his work. Further, when Mike tries to talk about his work, people automatically tune him out whenever he uses the word. Feel the mighty power of a single word! At the risk of sending you running for the hills, I'm gonna say it .... brace yourself .... ack ..... "underground". 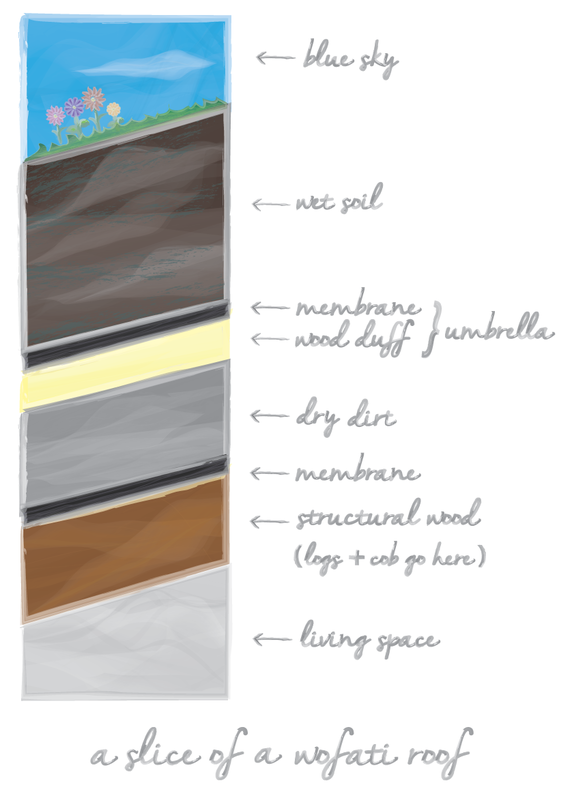 A lot of so-called "underground" homes are actually above ground homes with a green roof. So many feel like living in a basement. So many are abandoned because people cannot cope with the water problems, the constant chill and the musty dank of it all. And the moment you throw the u-word out there, damn near everybody runs away screaming - and for good reason! Mike's designs feel like living in a log cabin. Not a basement. Maybe it's the wood. Maybe it's that it's dryer. So here I am, combining Mike Oehler's ideas with John Hait's ideas and a few of my own. I've decided I need a whole new word to describe this. In the margin's of Mike's book, he quotes the letter from Chief Seathl (sometimes called "Chief Seattle") to the president, starting with "The President in Washington sends word that he wishes to buy our land. But how can you buy or sell the sky? the land? The idea is strange to us. If we do not own the freshness of the air and the sparkle of the water, how can you buy them?" As I read the letter in the margins and read Mike's book, I do sense a connectedness. 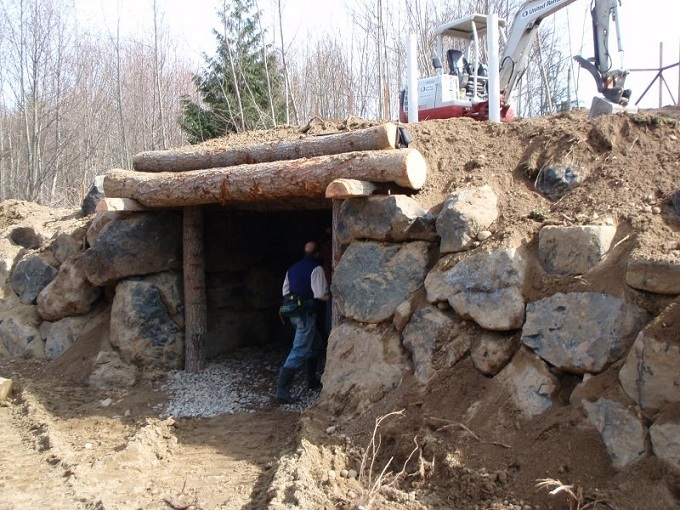 This whole structure could be built by native americans hundreds of years ago. If the polyethylene could be replaced with .... something else (I'm racking my brain to think of something - maybe layered wood duff with enough wood ash to slow rot, followed by a layer of clay? ), it could be done. So I want my new word to sound like something that could be native american. I have a bit of native american in my heritage. So I'm getting really jonesed about this connection! 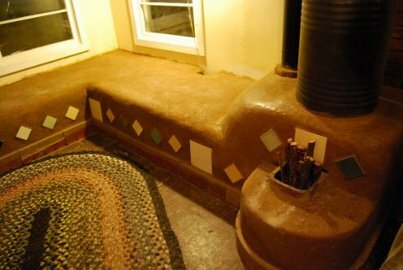 Some of the Navajo hogans had an earthen roof over a wood frame. The Pawnee, Hidatsa, Mandan, and Arikara had an earthlodge featuring an earthen roof on straw over a wooden frame. 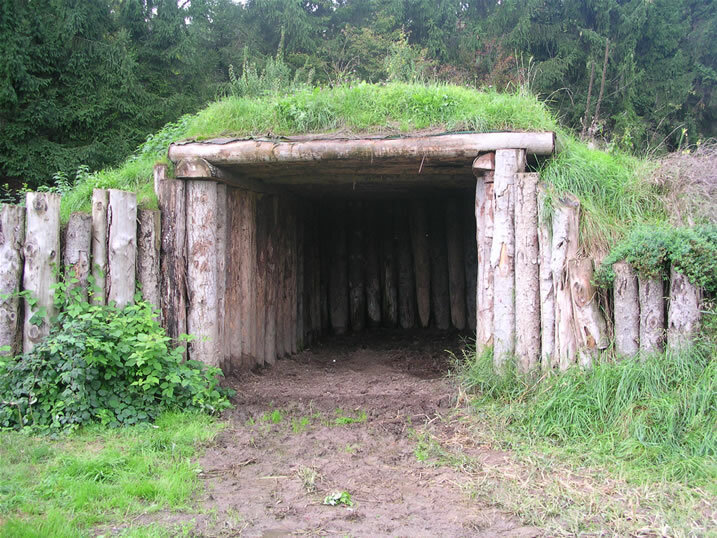 A British Columbia tribe had homes that were a wood frame with an earthen roof called a "quiggly" or "kekuli". Here in Montana, the natives lived in pit houses before they invented their portable houses which are now called tipis. I carried a scrap of paper with me for three months. I wrote down all of the words that described my design. I tried lots of things that turned out really lame. Then I decided to prioritize the whole list. And there it was. Woodland. The word "forest" suggests "forestry" which embraces a lot of things I don't care for. 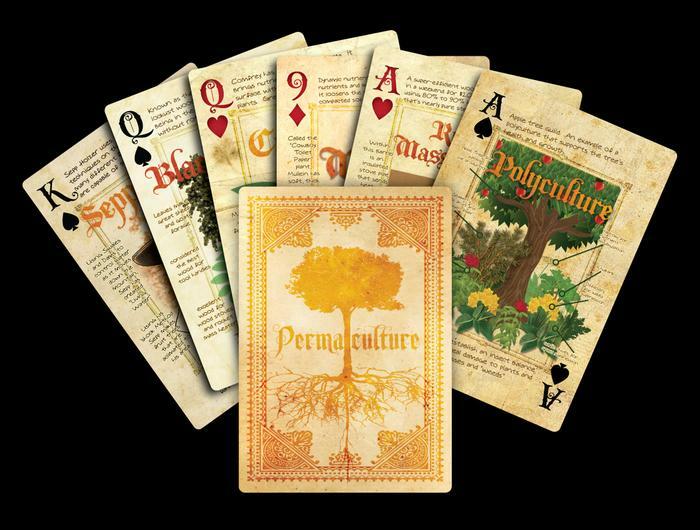 The word "woodland" reminds me of Ben Law's excellent books The Woodland Way: A Permaculture Approach to Sustainable Woodland Management and The Woodland Year. A forest is .... used. A woodland is .... something that you are part of. Well, the key to making this word the highest priority is that this whole design would be silly if not built on, or very near, a woodland. Mike Oehler. 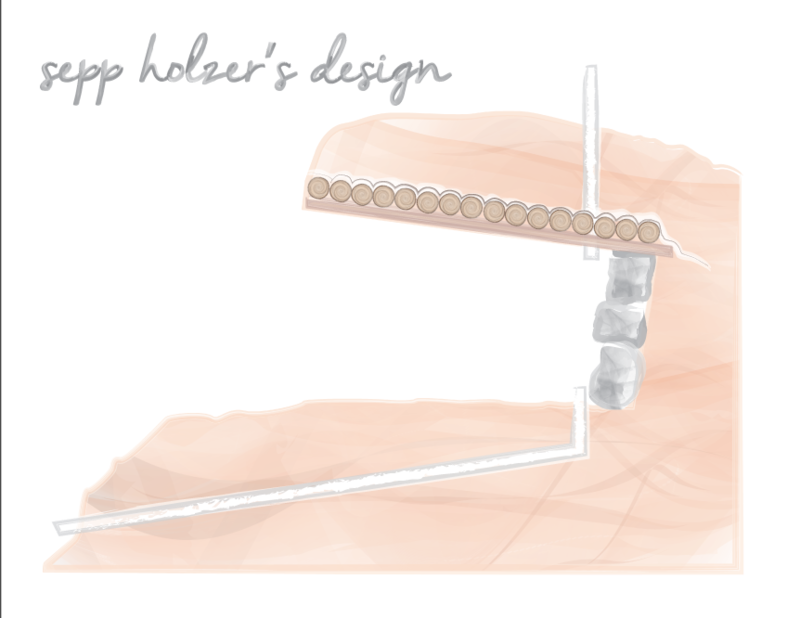 80% of my design is standing on the rather brilliant shoulders of Mike Oehler. Annualized Thermal Inertia. John Hait's book is called "Passive Annual Heat Storage" - but what the title leaves out is that this design also brings a great deal of cooling in the summer. I think the phrase "Annualized Thermal Inertia" is more accurate. Since I am making up this word, I get to define what it means. And not only do I want to define "wofati", but I want do define "wofati house", "wofati cooler", "wofati freezer" and "wofati animal shelter". The uphill side has a roof that extends at least five feet beyond the exterior wall. There is at least eight inches of dirt between the two layers of membrane. There is at least sixteen inches of dirt on the top layer of membrane. No treated wood is used in any of the structure. has all of the properties of "wofati definition"
The house is NOT "underground". This is an above ground pole structure with an earthen roof. Includes a pluggable vent tube that runs through the core of the thermal mass. The idea is to open these tubes on days that are below 10 degrees. The upper layer of membrane must cover at least five times as much square footage as the available square footage in the structure. The most important ingredient here is the membrane. Mike Oehler used to put tar paper on the structural wood, and then polyethelene on that. Then dirt, then another layer of polyethelene and then the rest of the dirt. 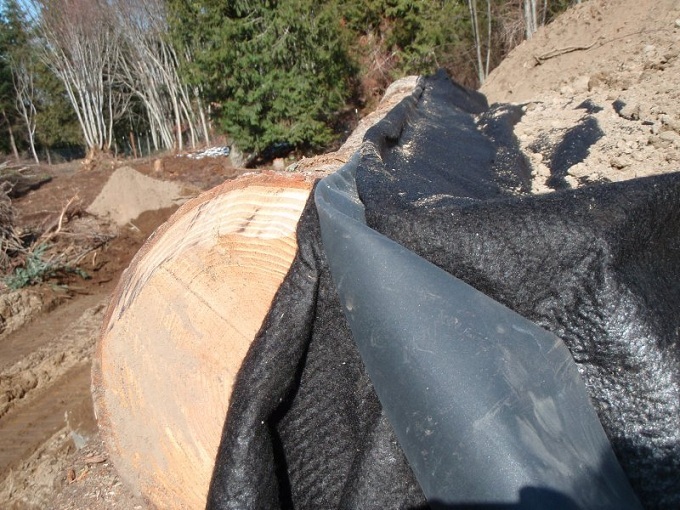 The tar paper is to protect the polyethelene from getting slivers. The upper layer of polyethelene could get a hole poked through it, but there is always the second layer as backup. Wood duff is going to be pine needles, twigs, wood chips, saw dust, peat, moss, leaves .... anything with some insulative value. It must be dry when you put it on. 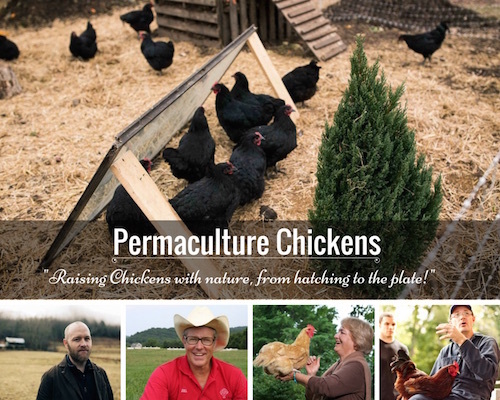 You can use perlite or vermiculite if you want to. Or mix it in. Sepp's technique is to lay down two half logs that span the sides of the shelter. Then, on top of that, lay down about fifteen logs all snug to each other and then lay down felt, pond liner, felt, and a meter of dirt. Mike Oehler does something similar, but he puts gaps between the top logs and covers them with milled 2x (2x4, 2x6, 2x8, etc.). Then tar paper, then poly and then dirt. I want to dodge paying so much for felt and pond liner. I also would like to dodge the toxicity of tar paper. 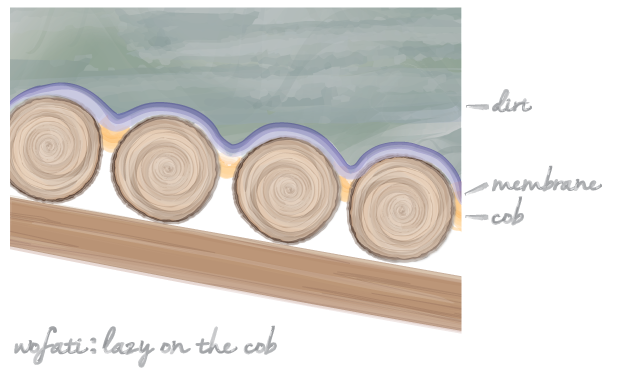 Plus, I like the idea of using unmilled wood - since it is more readily available when doing tree thinning projects. Here is the important part: total cost for the roof is about $100 for the poly and $40 for hardware to hold the wood in place. The wood is free. The dirt is free. Plus, this technique covers about half the walls too. And now for a trivia break! Mike Oehler lives in north idaho. Sepp Holzer lives in Austria. 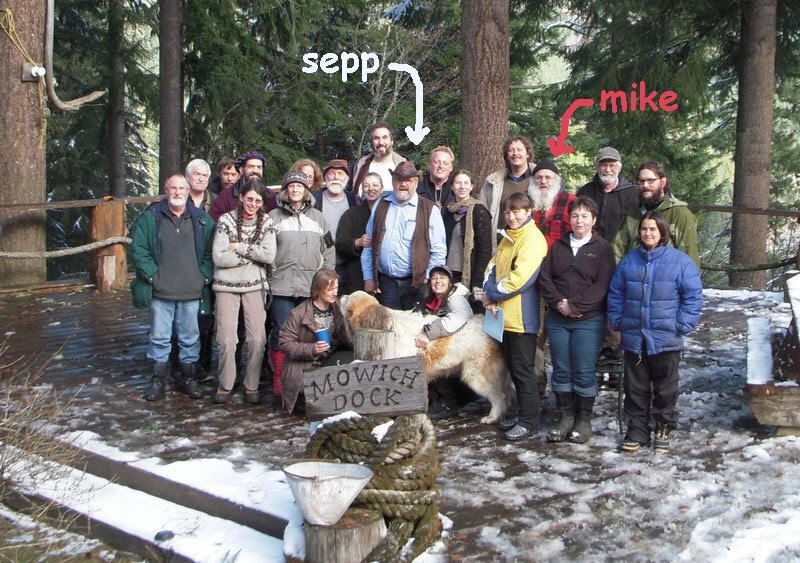 Sepp came to washington state to give a presentation on "Ponds on Sloping Land: Microclimates, Microhydro, Aquaculture" and Mike Oehler attended! The amazing thing is that neither of these fellas knew of the other fellas work before the workshop! They both came to very similar (genius) conclusions independently. Okay. Enough goofing off. Back to work. the first wofati at wheaton laboratories: "allerton abbey"
The following pics are from a house built in wales. The use of these photos is subject to the creative commons license. I really like these pictures. By looking at these pictures, I can see the house in these pictures being easily modified to be a wofati house. Thus making it cheaper and faster to build. Although if you follow the link, I think you will be pleasantly surprised at just how cheap this house was to build (1000-1500 man hours and �3000). Click on any of these images to see the full size super jumbo original. example of a possible gable roof? 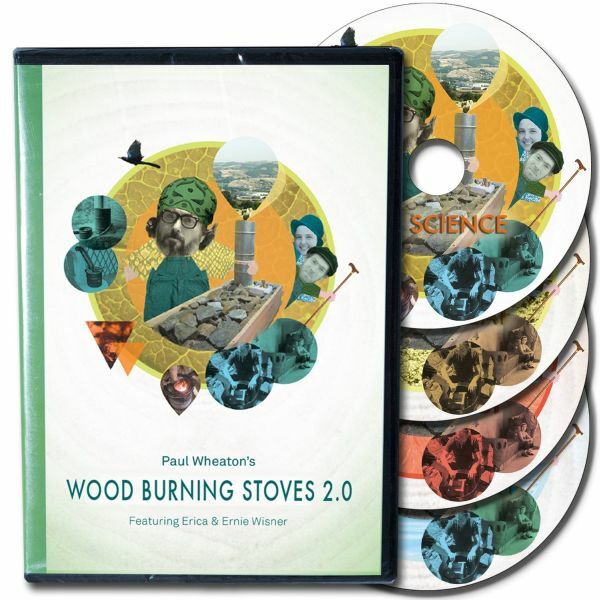 Combined Underground House Workshop and Shelter Seminar on DVD This is a three DVD set. The second DVD is the most important. It contains freaky big heaps of all of the different roof designs to get light coming from all four directions. Mike loves us so much he put together a super sweet deal for us with digital downloads: Click Here For More Details. If you are curious about how details on annualized thermal inertia, or if you would like to see examples of an Oehler structure that is a little more conventional, then you would be interested in the book, Passive Annual Heat Storage. You can get it here. There is a free chapter of the book there. He also has videos, but I have not yet seen them. 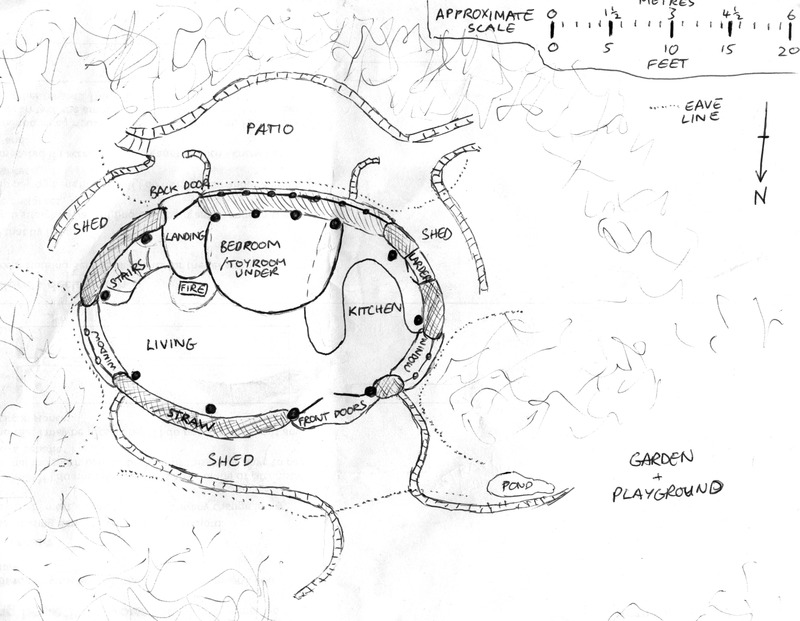 The author has also penned a short article with some excelling drawings that are worth a look. 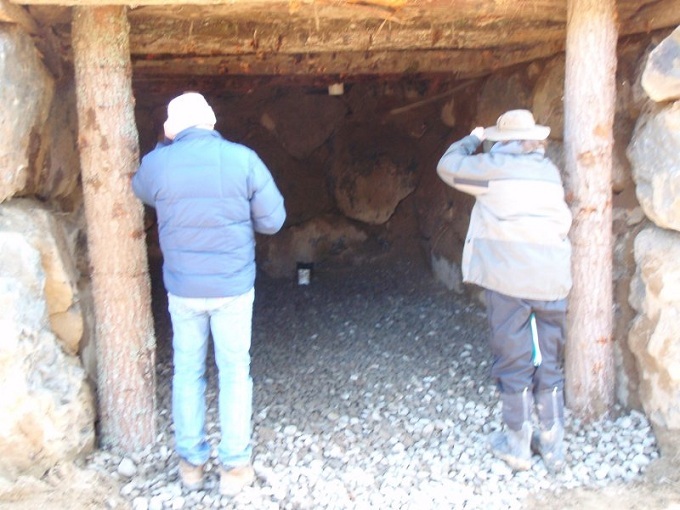 In the spring of 2009 Mike Oehler invited me out to his property to have a look around. I took lots of pictures and videos. I hope to get them all on-line soon. This first video is about the core of his book. The $50 house that was later upgraded to the $500 house. 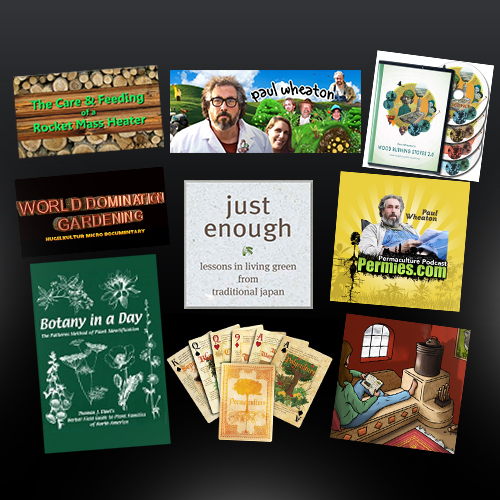 This next video is about Mike Oehler's greenhouse book. You know what a log cabin is. 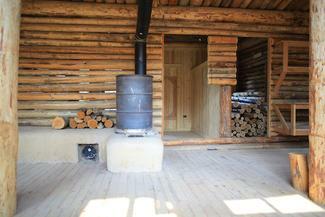 You have seen some really rough log cabins. And you have seen some log homes that are amazingly upscale. The funny thing is that it seems like so many people live on 200 acres of timberland and then they just buy a log house from a thousand miles away. A couple of big semi trucks pull up, put it together, and then drive away. I suppose that this could fit in the same boat. But to really connect with your land, it seems it would have far more value to use the materials right on your woodland. This is easier, cheaper and faster than a log cabin. More light. Same view. Warmer in the winter. Cooler in the summer. And you're not living in a ziplock bag. 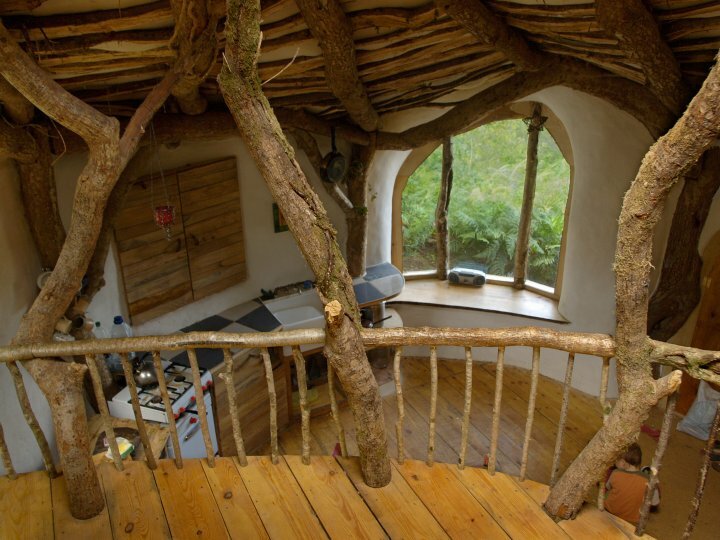 If you live in a woodland, I cannot imagine any building technique that would be more eco than a wofati. This has more than 90% of the building materials coming right off the land it is built on. A tipi made of skins could be more eco I suppose. 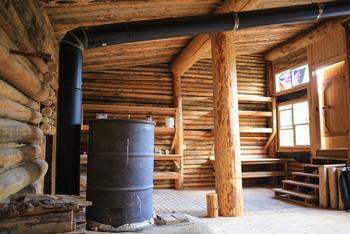 A log cabin could be almost as eco - if you build it Proenneke style. If there is a building style that is more eco, then I would really like to hear about it.